Role of Synaptojanin-1 phosphorylation in LRRK2-induced neurodegeneration in Parkinson’s disease. Dr. Islam received his BSc in Physics in Bangladesh and MSc in Bio-Physics in the Netherlands. He completed his PhD studies at the Max Planck Institute for Heart and Lung Research in Germany, where he gained strong expertise in proteomic and phospho-proteomic analyses, mass spectrometry, in vivo SILAC-based approaches, and Drosophila LRRK2 models of PD. Dr. Islam joined the Moore laboratory at Van Andel Research Institute in September 2015 to conduct his post-doctoral studies on elucidating the molecular and cellular mechanisms by which autosomal dominant mutations in the LRRK2 gene precipitate neuronal degeneration in PD. 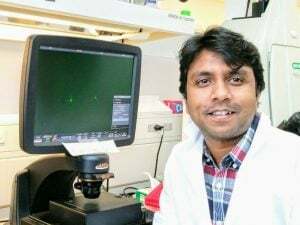 In particular, Dr. Islam is interested in the proteomic identification and validation of novel kinase substrates for LRRK2 and functionally defining their contribution to mutant LRRK2-induced neurotoxic pathways. His studies are important for elucidating novel pathways downstream of LRRK2 activity, new therapeutic targets and potential biomarkers for PD. Mutations in the leucine-rich repeat kinase 2 (LRRK2) gene are the most common cause of autosomal dominant PD. LRRK2 is important for the development of both familial and idiopathic forms of PD. Recently, we have generated a new R1441C LRRK2 Drosophila model of PD that exhibits progressive dopaminergic neurodegeneration and we have identified Synaptojanin-1 (SYNJ1) as a direct, novel substrate of LRRK2 kinase activity in fly brain by using mass spectrometry. We will now examine the functional interaction of LRRK2 with SYNJ1 and how SYNJ1 contributes to LRRK2-induced neurodegeneration. Taken together, our studies will establish the contribution of SYNJ1 phosphorylation to LRRK2-induced neurodegeneration, which may aid in the identification of new therapeutic approaches for treating LRRK2-linked Parkinson disease.